Featuring Some of the Amazing Meals Prepared on Crewed Charter Yachts for Guests. Chef Alli, 0nboard the Crewed Charter Yacht Kelea described one of their featured dinners this week onboard Kelea. 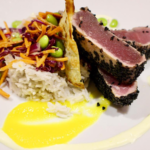 They had locally caught Sesame Crusted Ahi Tuna over Coconut Rice /Edamame Slaw with Wasabi Aioli and Fresh Mango Puree. 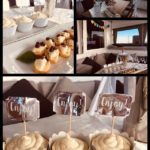 Onboard Crewed Yacht Altessa a surprise party was thrown for three 18 year old girls who were celebrating their high school graduation. The surprise party included cupcakes and pink bubbles !!! Great time was had by all.. 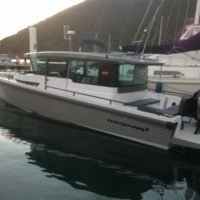 There is a new water taxi service based in Nanny Cay, Tortola BVI. Its called Island Time and is an excellent choice for visitors arriving in St Thomas as you do not need to worry about ferry schedules if your plane arrives late. Island Time Water taxi can pick up in the USVI and take you to your final destination in the BVI. They are based in Nanny Cay but can take you to any other point of meeting eg Road Town, Peter Island or Jost Van Dyke. 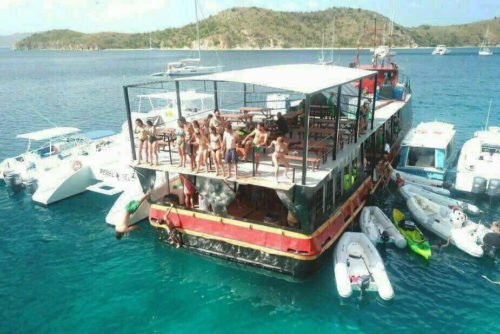 Some of the USVI water taxis can only take you to the port of entry and drop you there. Thus leaving you to find another mode of transportation to continue to your desination. Island Time is a BVI registered vessel and can continue to take you past the port of entry to your final drop off point. Island Time’s boats are in full compliance with BVI Shipping Registry’s and USCG’s safety requirements, as well as being registered and insured in the British Virgin Islands. The BVI is called Sailing Capital of the Caribbean. By Kathy Corbett|2019-01-24T03:17:34+06:00November 9th, 2013|Yacht Charter News|Comments Off on The BVI is called Sailing Capital of the Caribbean. The British Virgin Islands have a renowned charm and character of their own. With over 60 picturesque islands bathed in sun and blown by the Trade Winds, they’re considered the best sailing destination of the Caribbean, if not the most idyllic. Steeped in Pirate myths and tales of hidden gold the names conjure up a swashbuckling past, from Dead Chest Island to Treasure Point and Little Trunk Bay, even Salt Island still pays in salt to the British Queen! Each hilly island is covered by lush tropical vegetation that stretches down to white sand beaches; surrounded by the calm, clear, turquoise waters which are teaming with sealife. You can watch the pelicans dive while little bait fish swim round your toes in the surf or take a snorkel dive off the back of a yacht and discover the beautiful reefs where Parrot fish nibble on the coral, and turtles glide by. The largest island in the chain is Tortola (the capital), then Virgin Gorda, Jost Van Dyke and the wild coral atoll, Anegada. Being close to each other guarantees carefree easy sailing, with your next anchorage always in sight. BVI is home to some of the finest yachts in the world. Get in touch with us to book a crewed yacht charter for the British Virgin Islands or the Caribbean. 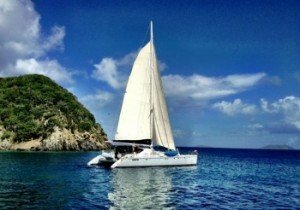 On a typical day you could leave Tortola’s pretty West End in the morning, sail out and across the channel to Jost Van Dyke. Anchor up and swim the few meters to shore to the ‘Soggy Dollar Bar’ for one of their famous Pain Killers in time for a leisurely lunch! The British Virgin Islands are considered the Sailing Capital of the Caribbean due to our subtropical weather with temperatures moderated by trade winds which are ideal for sailing. There is little variation between summer and winter, rainfall is low varying from island to island, humidity levels range from 78 to 88% with the most humid months between June and August. Our hurricane season is June to November.